It was a sad day in Israel when Joshua died after his 100th birthday. Satan deceives many with the plausible theory that God's love for His people is so great that He will excuse sin in them; he represents that while the threatenings of God's word are to serve a certain purpose in His moral government, they are never to be literally fulfilled. But in all His dealings with his creatures God has maintained the principles of righteousness by revealing sin in its true character—by demonstrating that its sure result is misery and death. The unconditional pardon of sin never has been, and never will be. Such pardon would show the abandonment of the principles of righteousness, which are the very foundation of the government of God. It would fill the unfallen universe with consternation. God has faithfully pointed out the results of sin, and if these warnings were not true, how could we be sure that His promises would be fulfilled? That so-called benevolence which would set aside justice is not benevolence but weakness. Before the death of Joshua the heads and representatives of the tribes, obedient to his summons, again assembled at Shechem. No spot in all the land possessed so many sacred associations, carrying their minds back to God's covenant with Abraham and Jacob, and recalling also their own solemn vows upon their [p. 523] entrance into Canaan. Here were the mountains Ebal and Gerizim, the silent witnesses of those vows which now, in the presence of their dying leader, they had assembled to renew. On every side were evidences of what God had wrought for them; how He had given them a land for which they did not labor, and cities which they built not, vineyards and oliveyards which they planted not. Joshua reviewed once more the history of Israel, recounting the wonderful works of God, that all might have a sense of His love and mercy and might serve Him "in sincerity and in truth." The aged leader urged the people to consider, in all its bearings, what he had set before them, and to decide if they really desired to live as did the degraded idolatrous nations around them. If it seemed evil to them to serve Jehovah, the source of power, the fountain of blessing, let them that day choose whom they would serve—"the gods which your fathers served," from whom Abraham was called out, "or the gods of the Amorites, in whose land ye dwell." These last words were a keen rebuke to Israel. The gods of the Amorites had not been able to protect their worshipers. Because of their abominable and debasing sins, that wicked nation had been destroyed, and the good land which they once possessed had been given to God's people. 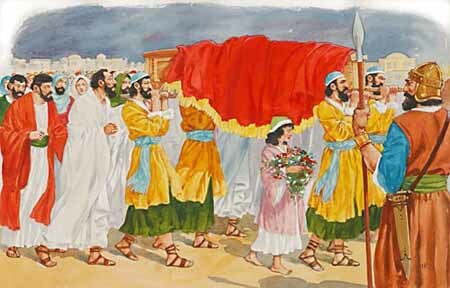 What folly for Israel to choose the deities for whose worship the Amorites had been destroyed! "As for me and my house," said Joshua, "we will serve Jehovah." The same holy zeal that inspired the leader's heart was communicated to the people. His appeals [p. 524] called forth the unhesitating response, "God forbid that we should forsake Jehovah, to serve other gods." Click here to read the next chapter: "Tithes and Offerings"